Our wide selection of inflatable kayaks from Gumotex & Sevylor includes a number of models sepcifically designed for one person & solo use. These include dedicated single person inflatable kayaks as well as 2/3 person craft with adjustable seats which allow them also to be used solo for maximum. All our inflatable kayaks are designed to be compact when packed so easy to store and transport even for 1 person. We offer a range of compact and lightweight single person inflatables for solo use. From a little as 9kg and the size of backpack you can have an easy to transport one person blow up canoe. 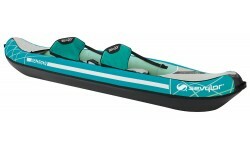 The Twist 1 is a stable & easy to paddle 1 person inflatable kayak from Gumotex. Constructed from Nitrilon material & extremely lightweight at only 9kg. This combined with its small pack size makes the Twist 1 easy to transport & store. Some of our 2 & 3 person models such as the Gumotex Solar, Seawave &, Sevylor Madison have adjustable seats meaning they can also be paddled solo as well as with others. The Seawave is a hugely versatile and high performing sea & touring kayak capable of long distances & expeditions. Available with closed cockpit deck for 1 or 2 as well as optional rudder and 3rd seat. Suitable for solo, tandem or 2 adult + child use.